You are browsing the archive for Forensic Analysis. If you use PE Viewers, Editors, Dumpers for forensic purposes, you are most likely using them to extract a compilation timestamp from a binary – to determine when a specific file was compiled. There is a little ‘gotcha’ here. Some of these tools show the timestamps as UTC, some localize them to your timezone. This is far from ideal. Without being sure, you may be writing down incorrect information in your report. If you don’t know the algorithm your tool of choice is using to display the time you can quickly test it. So, there is no better way to test your fav. programs other than using atest executable with a timestamp set to 0, and observe the results (make sure you change your timezone to a different one from UTC!). If the result is 1970-01-01 00:00:00 then your tool is using UTC. If it is different, then it’s a local time, and perhaps in some cases, it may be wrong (better test with two different tools). As such, you may even see compilation year 1969! I would also take note of daylight saving time. Offset of UTC changes from your local time zone. And here is the test .exe I used, in case you need it. and many other libraries with a .fne, or .fnr file extensions, or perhaps found some of these files during a forensic exam, then this post is for you. 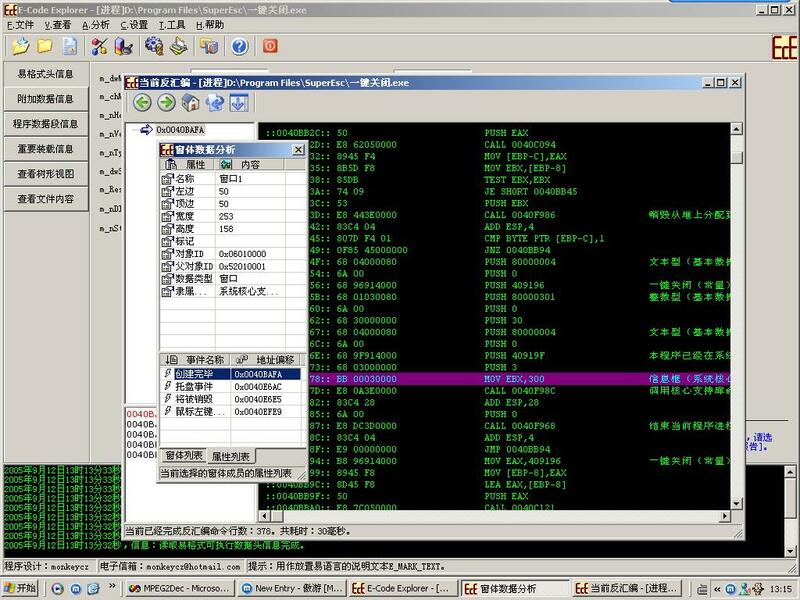 These executables are generated by so-called Easy Programming Language (EPL), a RAD, Visual Basic-like programming language and software development environment available from this Chinese company, and also available from this website. It’s not super popular, but it definitely has a following in China as programs are still being written in it. Including malware. 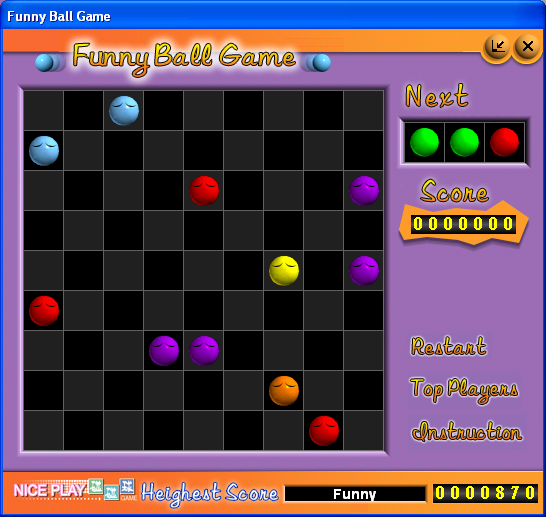 If you are in a hurry, you can download and play with the actual RAD v 4.01 from here or here. 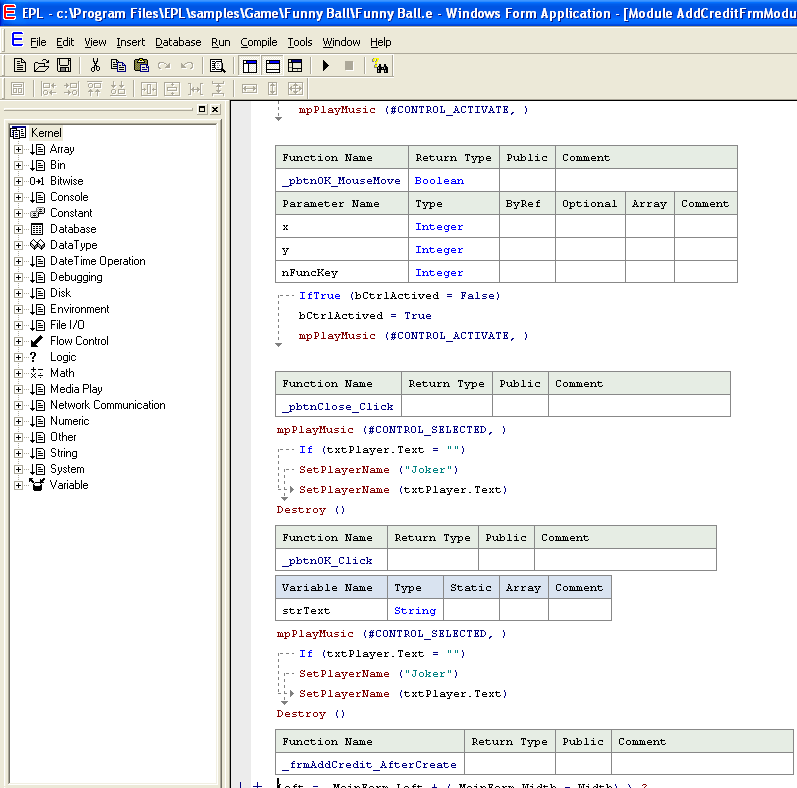 Now that we compiled and ran the executable, we can look at the file itself. While the framework requires you to register before you can build the standalone programs, it still provides a way to compile & test them. For the test purposes it provides a small stub executable that launches programs, and does so from a Temporary directory. 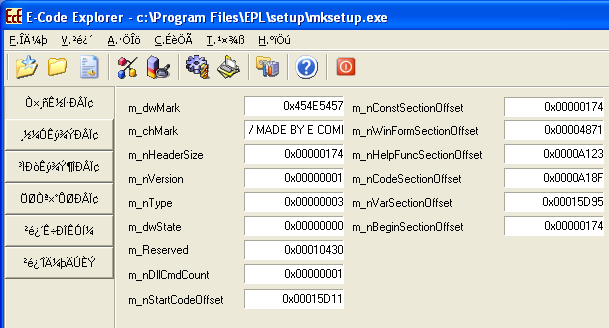 The commercial version allows to package it all into one standalone .exe. It’s the ‘packaged’ version of .exe we will typically come across ‘in the wild’. Not found the kernel library or the kernel library is invalid! I am not sure if this timestamp is good enough for any identification as I don’t have enough samples. Plus, this is a stub used for testing. Still, it could be used to run actual E programs (you can find some on github and elsewhere). 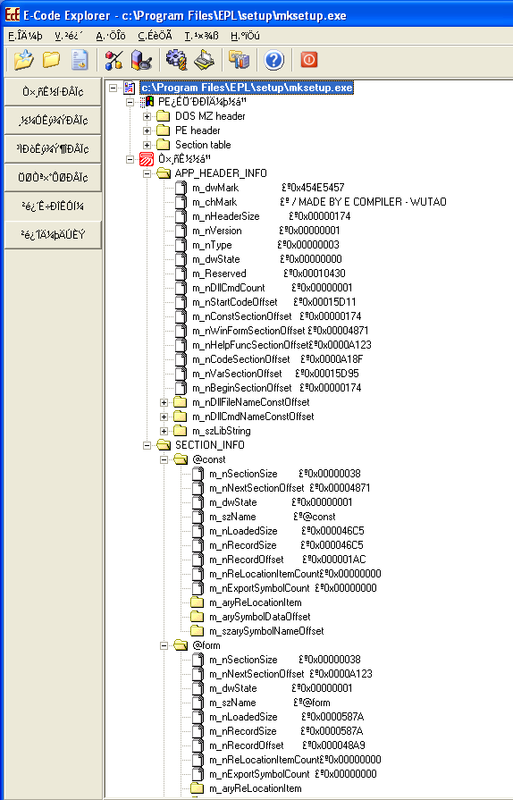 The .ecode section name is very characteristic, and I have added it to my PE Section list; you may also come across .edata section; this, together with a list of strings, and modules listed earlier (and probably a few more than can be found online – one can create new ones) should be enough to ID the files (e.g. via Yara). During the development phase programs are stored in files with a .e file extension. Some programmers distribute them in this form as well (again, that’s what you can find on github and elsewhere!). 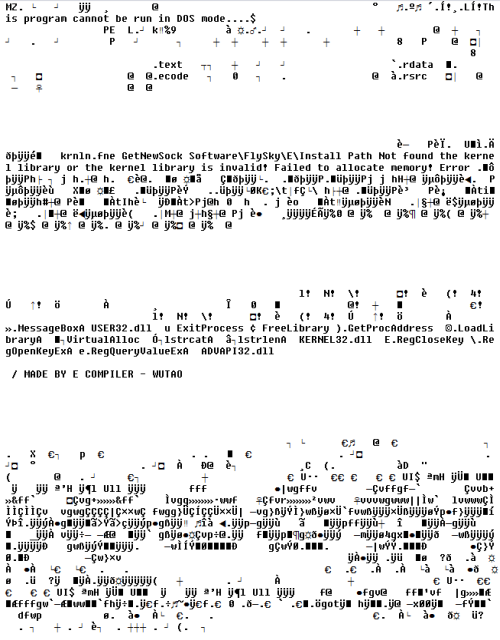 References to a MainForm string, and top bytes (BM) of a of a bitmap (.bmp) file are clearly visible. The graphic files can be carved out easily from a .e file. 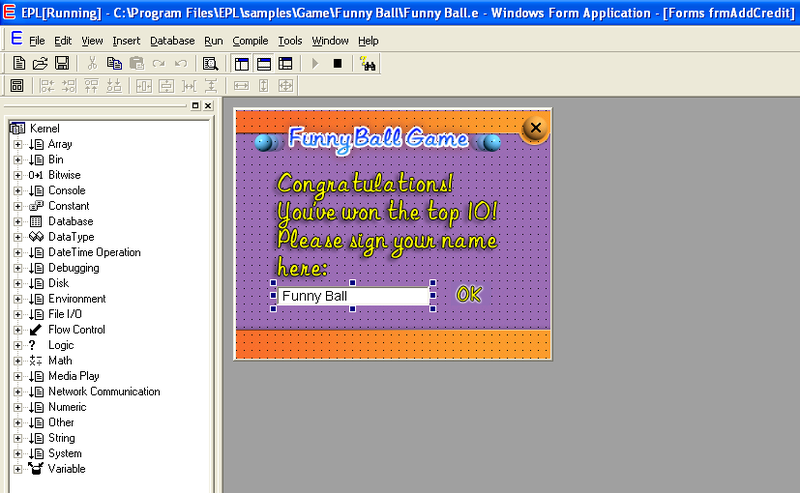 Plus, we can always load the file into the actual developer environment to see what the source code it holds. Also, when I looked at this file format a few years ago I recall seeing actual description of the internal structures of the standalone .exes, but can’t find it at the moment.